So basically, this guy is old. He’s a whopping 75, which unfortunately means it’s time for mandatory retirement from his position as Federation Ambassador at Large. 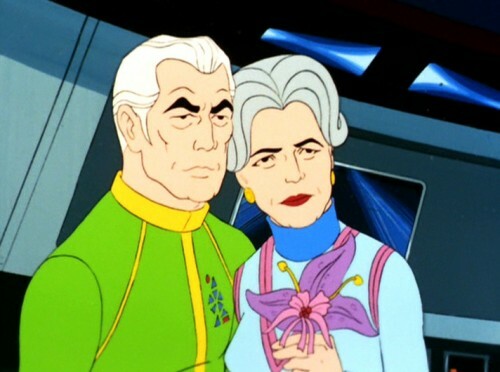 His wife, Sarah–the first medical officer to serve on a starship–is also along for the ride, clutching a Capellan flower as if her life depended on it. McCoy turns on the charm and compliments her flower, but she tells him it has a bad prognosis: it only lives for a few hours, and now it has more time behind it than ahead. Just like her and her husband. But enough dwelling on their impending death. Kirk wants to show them one more beautiful thing in the universe before their lives end, so he arranges for the ship to swing by the Beta Niobe supernova, which is… Oh, right, a dying star. “It is beautiful, but also very deadly,” Sarah reminds them—as dangerous as that alien ship barreling towards them at an incredible warp 36! They move out of its way and it keeps on going, straight for the supernova. It doesn’t respond to their hails, so Kirk orders a tractor beam, which slows the other ship slightly but also drags Enterprise along behind it at increasing speeds. The other ship finally hails them: a woman speaking a language none of them are familiar with. I am on a priority mission. Your beam is slowing my progress. Release my ship at once or I am doomed. Obviously, she’s too stupid to realize that she’s on a suicide course for a supernova; Kirk is determined to save this stranger whether she likes it or not, even if it means putting his own ship at risk. Engineer Scott reports that the engines are buckling from the strain of trying to slow the alien vessel—they’re being towed by their own tractor beam at warp 11, and rising. Kirk finally decides to back off, but the ship’s tractor beam is stuck in the on position. They might have a chance at the very last nanosecond, if they change course as soon as the other ship burns up in the nova. As they prepare for this difficult maneuver, they’re astonished when the alien ship continues through the nova unharmed. Unfortunately, they’re still tethered to it with no way to break off, and it’s doubtful that they can survive the incredible heat at the heart of the star. “It’s got to work,” Kirk insists. He tries pushing the same buttons Sulu did, as though they will suddenly work for him. Astonishingly, they don’t, and Enterprise enters the nova. Instead of the fiery death they were expecting, they make it through unscathed and find a strange sight on the other side: black stars in a white void—a negative universe. In this backwards region, everything else runs backwards too, from the ship controls to their brains. And that’s not all! The ship’s clocks are turning back, and Sarah’s flower is blooming again. Everyone onboard is growing younger. Another side effect is that they can now understand the alien woman, Karla 5, when she calls up to berate them for almost screwing up her trip. KARLA: I am an explorer of space. I was caught unaware when Amphion, previously a dead star, went nova and came to life. I was pulled into the star. But instead of burning up, I passed into a universe where everything operates in reverse to my universe. KARLA: Yes. My theory is that two stars going nova in the same place in both universes created a gateway which I passed through. APRIL: In her universe, a nova is a dead star which comes to life! And when the explosions of a nova in her universe and one in our universe occur together, it’s possible to travel between the two universes. This is easier said than done, when the chances of two novas coinciding like that in both universes is slim to none. Sounds like they’re going to need a wild coincidence to get out of this one. They follow Karla back to her planet, Arret (see what they did there? ), to consult with their scientists for a solution. There they meet Karl 4, Karla 5’s son, who is older than she is because that’s how they do things here. He shows them a map of their galaxy in his laboratory, which Spock correlates with a map from the positive universe so they can see if any novas overlap. To their dismay, none of them line up. So they decide they’ll just have to make their own miracle and ignite a dead star a little early to force a nova on their schedule. One teeny hitch: the only way to avoid burning in the star is to move through it really, really fast–at speeds the Enterprise can’t reach unassisted. Karla 5 generously offers her ship, which can tow them on autopilot so they can leave the way they came. They load enough positive matter on her vessel to wake up a dead star and set course for one that matches a known nova in their universe. Of course, there’s still the other pressing issue: everyone on the ship is getting younger. This might not be all that bad, if they weren’t also forgetting how to run the ship, not to mention having to go through puberty all over again, this time in reverse. While the Enterprise crew is reverting to childhood, April is looking pretty good, just returning to his prime years as a Starfleet captain. When Kirk can’t remember how to operate a tractor beam or make a responsible decision, Spock tries to assume command–as a Vulcan, he ages much more slowly than humans–but the commodore pulls rank and soon he’s back in charge of his old (but increasingly younger) ship. It’s clear sailing from there. The impact of Karla 5’s ship, bearing its positive matter cargo, ignites the star and before you can say “diaper change,” Enterprises pushes through to home sweet home. APRIL: We did it! We’re home again! We’re all right. We’re home. The reverse aging process has stopped. SARAH: But the Enterprise crew, they’re all children. SARAH: But what about us? We don’t have to use the transporter. We can remain young, live our lives over again. You could command a starship once more. APRIL: What a blessing to be able to live one’s life over again, if the life you’ve led has left you unfulfilled. No Sarah, I don’t want to live it all over again. I couldn’t improve one bit on what we’ve had together. And that, ladies and gentleman, is why the Aprils’ marriage has lasted so long. Having turned down the opportunity to relive his youth, the re-oldened commodore is rewarded for his heroic rescue with a Starfleet communique announcing that the mandatory retirement age is now optional! Maybe people can still be useful, contributing members of society after the age of seventy-five after all. It’s a happy ending all around, even for Sarah’s flower. The finale of the animated series is a far sight better then the original’s “Turnabout Intruder,” that’s for sure. In some ways, this episode is a perfect ending for both series, as it celebrates a second chance at life and returns the show to its roots, by introducing the first captain of the Enterprise, Robert April, and the first ship’s medical officer, Sarah April. I’m sure there’s a story there, of how those two got together, just as I’m sure fans have written it many times. I literally shook my fist at the screen though, when April blithely suggests they just run everyone through the transporter to restore them to their proper ages. It’s become part of protocol, for goodness’ sake! Similarly, many of the mechanics of the negative universe are simplistic and silly–their brains think backwards? The ship is flying in reverse? I cracked up when Sulu forgot how to pilot the ship, and this conceit of “losing knowledge” also introduces a significant plot flaw: April shouldn’t remember all the years he had with Sarah–he thinks he’s a captain, after all! Maybe he’s just assuming they have an awesome life together, since her flower is blooming again. Ahem. 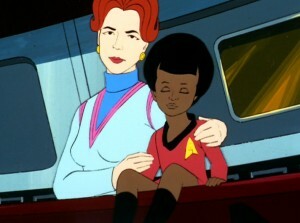 For every good detail (like the later Captain’s Log having an earlier star date) there’s a weak one (such as the crew’s clothes inexplicably shrinking with them), but all my complaining about inconsistencies, crap science, and the unusually terrible voice acting may simply be overruled by one thing: baby Uhura is adorable! Torie Atkinson: Now this is what I’ve been waiting for: an engaging premise, wonderful characters, some tense action, and in the end, a bittersweet reflection on life and the series itself. The teaser blindsided me with this beautiful young woman speaking incomprehensibly and hurtling to her seeming doom. From that moment I was entirely taken in by the story, ludicrous as it may be. (While I fully acknowledge that the reverse universe makes absolutely no sense, I don’t really care: it’s clever, fun, and entirely compelling, which is more than I can say for 90% of the tricks we’ve seen in the Animated Series.) The white sky full of black stars just enthralled me, so alien and mysterious. I wanted to see more of this place and the people in it. Robert and Sarah April are equally wonderful characters, seasoned veterans strengthened by both their service and their love for one another. They both seem so at home on the Enterprise, and yet it’s clear that their time there has passed. A new brood has taken over their stations but there’s no resentment, no envy, and no regret. They are both immensely proud of their achievements and the Commodore in particular seems as enthusiastic as ever about his life’s work. I can’t say I’m wholly convinced by his rejection of being young again–what’s to lose? It’s not like it’ll make him immortal (one of those offers I find entirely rejectable)–and yet that choice demonstrates precisely the kind of fearlessness, confidence, and maturity that has always graced the captain’s chair. When the Commodore said there wasn’t a single moment in his life that could have been improved upon, I confess to having teared up a little. What more could anyone ask for? Would youth have changed that, added to it in any way? As for Sarah, I was pleased that McCoy had a chance to gush a little about her advances as a “pioneer doctor in space,” and they share some of the same rugged, down-to-earth qualities. (I do wonder about the Spock of April’s ship. Guess he must’ve felt like a third wheel with those two.) I wish she could have done a bit more when the Enterprise was in crisis, rather than just be a standard-bearer for an exotic flower. Was anyone else annoyed that as they got younger, Robert sounded more chipper but Sarah still sounded wheezy and old? Commodore April’s presence establishes a nice continuity in the series and in Federation history. I like that Robert April, Christopher Pike, and James T. Kirk were the three early incarnations of who would be captain, and each was able to come into the final series in some small way (retaining their chronology, too!). Ultimately it is not the captain but the idea that matters. Both the Enterprise and its mission live on, even when different leaders are at the helm. They have something greater than their individual personalities to keep the spirit alive from from series to series and from generation to generation. I don’t think even Roddenberry could have known then how much that would resonate as the decades went by. The episode’s narrative of birth and rebirth is a wonderful parallel to the show’s own resiliency. Has any other show come back from the dead over and over again, reinventing itself for so many new audiences and formats and generations? April’s dedication to serving the ideals of the Federation sends a beautiful message: life is only over when you give up on it, and even 20 (or for the series, 45) years later, age ain’t nothin’ but a number. What a lovely, touching way to end the series. I hereby grant my first, and sadly only, warp 6. Best Line: APRIL: What a blessing to be able to live one’s life over again, if the life you’ve led has left you unfulfilled. No Sarah, I don’t want to live it all over again. I couldn’t improve one bit on what we’ve had together. Arret was previously used for a planet in an early script for the original series’ “Return to Tomorrow,” but didn’t make it into the broadcast episode. Other notes: This is the first time Star Trek characters revert to the age of children, but not the last. The idea is revisited in TNG’s “Rascals,” which also uses the transporter as a magical solution. On the show Mork & Mindy, people from the planet Ork age backwards. You knew that, right? Next up: The Star Trek Animated Series Wrap-Up. A well-written episode with what I consider to be a really poor MacGuffin. I just can’t accept the whole aging backwards thing. Also, Star Trek babies. But it is well-written with good characters and dialog and the writer understood the main characters better than most. I’m not sure I really by the Aprils decision not to stay younger. If their time together is so terrific, then why not add a few more decades of good health and vigor? The aging-backward thing was cool, but stupid. I tend to let it go on Rule of Cool. One thing that’s always annoyed me about the show, though, is their grating tendency to have clocks start to run backwards, as a way of showing that time is reversing. Clocks don’t run on time. They MEASURE time. Gah. I mean, everything else is still running forward on the ship while they accelerate into the past, they don’t talk backwards, the warp drive doesn’t turn space inside-out, why the hell should a mechanical clock be running backwards? Gah. Not that that has much to do with this episode, it’s just that they used that stupid trope, and it always, always jars me right out of the story, because it’s such a fundamental lack of understanding of what a clock is, and its relation to the concept of time. And I expect better on my sf shows! I’m in total agreement with CaitieCait @2, but at least the clock thing has a long tradition in ST going all the way back to “Tomorrow is Yesterday”. Another piece o’ trivia: The exit the alternate universe from the nova “Minara”, which was from “The Empath”. There is a lot of wonky science in this episode, and questions left unanswered ( probably for the best…I just don’t understand the biological cycle of the alternate universe. How are they born? Do they crawl up from a grave, and when they die do they return to the womb, but they can’t because their mothers are younger than… oh, never mind ). But as a kid, I really got a kick out of it. Another episode that got a very nice expanded treatment in Alan Dean Foster’s book series, as he took the episode, then added another original full story afterwards, which involved space douches testing the Enterprise crew and a group of Klingons, by creating the illusions of the backward universes ( the Klingons went to a planet called Nognilk ). This went a long way towards explaining the wonky logic. There was also an expanded intro to the story which had April remembering being present as the ship was assembled…in SPACE ( do you hear that, J.J.? ). They even managed to name check Franz Joseph, and his blueprints which were printed around the same time. Fun light reading, if you can find a copy. …everything else is still running forward on the ship while they accelerate into the past, they don’t talk backwards, the warp drive doesn’t turn space inside-out, why the hell should a mechanical clock be running backwards? That clock thing always bugs me too, but I explain it away as the Enterprise having more sophisticated sensors. If things like “chronitons” actually exist, can’t they measure them and tie that into the ship’s clock? Maybe there’s some universal “atomic clock” that the ship is getting its information from. As for the ship systems running in reverse, that really didn’t make any kind of sense. Why should the ship fly backwards in a negative universe? It was all just a gross simplification of the conceit. You know, for kids. To be fair, they’re only babies for maybe five minutes of the episode. So at least it didn’t get into poopy time or anything else lacking in dignity. I would’ve been young again! Stupid Aprils. I, too, always assumed it was some kind of galactic chrono-whatsit. In any case, I think it’s a really simple way to communicate a concept to kids who may not otherwise get it, so I gave it a pass. As for the ship’s engines, it’s because physics is reversed! Up is down, black is white, cats and dogs are living together! Oh, come on, you aren’t so young that you completely missed the late 80s trend of coming out with a “babies” version of every successful franchise, are you? It started with the Muppets (thus proving that even Henson nods) and expanded unpleasantly in a lot of directions. It was an abomination and I react badly to anything that is reminiscent of it. I loved The Muppet Babies as a kid. I make no apologies. Yeah, I liked Muppet Babies too. And A Pup Named Scooby Doo, though I was never partial to Tom & Jerry Kids. Tiny Toon Adventures wasn’t exactly the same thing, but it was in the right spirit. One thing that strikes me running through these episodes again is there is not a single thing in them that could not be considered “official canon,” not a single thing inherently disrespectful to the franchise. This episode in particular is almost painstakingly respectful to the franchise and, as others said, is fairly dignified as a send-off. Sure, some episodes are dumb; but a few have more dignity and self-awareness than the live-action OS (Plato’s Children, The Children Shall Lead, anyone?). Nothing happens in TAS that might be “outside” ST continuity, and much happens within them that expands and strengthens the common themes. Add to that the casting and production, and one wonders why these episodes are now considered verboten to the point they’re removed from Chronology. I wonder if the original voice tracks are available so that some future project might remix and mashup a few of these episodes with better animation? Probably two or three of them mixed-&-mashed into a single hour-long episode might be watchable. Now you’re making me feel old. It’s obviously generational or something. For all the Muppet lovers I knew, it was an abomination. O tempore, o mores. Would it make it better or worse if I said that The Muppet Babies were my first muppets, and The Muppet Show came later? Would youth have changed that, added to it in any way? Of course! It would’ve been more of it! You don’t try to re-live a life you’re proud of, but this wouldn’t be a do-over, it’d be a do-more. “Honey, I’d never want to grow old with you again” isn’t exactly the sweetest thing you can say. Issues with the conceit, of course, as people have noted — for me it’s “Wait, if they forget things that happened in the past, how do they remember the conversations they’re having right now?” Also, they’re all adults. To regress back to infancy, they’d have to have an accelerated time reversal. On a less critical note, I kind of wonder if there’s a way to fit Kirk, Pike, April into the Goddess Trinity of Virgin, Mother, Crone. I’m not sure there’s a good reason to do any such thing, but it came to mind just now. I did think this was a very strong episode. One I’d definitely canonize (even if there’s other TAS I definitely wouldn’t). You sprained my brain with images fo Kirk and Virgin in the same conceptual framework. Even if I accept the aging-in-reverse thing, why would it happen so FAST? People age one year at a time, not years in a day!